I don't really look at this picture a lot. I make it the profile picture on my personal Facebook page on days like today, Veteran's Day, Memorial Day, and so on. 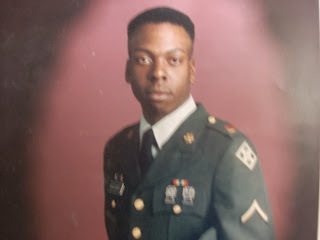 I was in the U.S. Army from 1993 to 1996. I remembered the day that I decided to go in, I was seriously poring over college applications in my senior year at Berkeley High School. My dream was to go to Penn State and get an engineering degree. I had the grades but not the money. I come from a large military family and when the idea popped into my head to go into the Army, it was confirmed moments later when I got a call from Staff Sgt. Kane, the recruiter at my school. He asked me what my plans were and noted that I had a really good ASVAB score. I took it as a sign that I needed to join the Army. I was luckier than most. As I said, I came from a large military family and at the time, my brother was on recruiting duty for the Army at Ft. Dix, NJ. A lot of recruiters do not volunteer information and my brother told me all the questions to ask and all the MOS (Military Occupational Specialties) I was qualified for. I remember being in the inprocessing station some time later and someone bragging to me that they had only had to enlist for 3 and a half years. I showed him my paperwork and how after a moderate amount of negotiation, managed to sign for 2 years 17 weeks. I have to say that it was never that I didn't like the military or that I looked at it like a horrible thing. In fact, it was the opposite. My father was in the Navy at a time when black men were not really equals and had risen through the ranks, gone to Vietnam, raised nine kids of which I was the youngest, and retired. To this day, on weekends he drives a van full of young, bright eyed kids like me to the inprocessing station in Columbia from Charleston, all the while telling them what to expect and regaling them with stories that we had long ago gotten tired of or never got a chance to hear because they were too embarrassing to share with one's children. I loved the Army, before, during and after I went in. I remember going to work with my father sometimes and just thinking about how cool he was. I liked the click-clack of his highly polished shoes and the way people would get out of his way when he was coming, with a curt "Good morning, Master Chief." The Army was a bit more regimented but there was a realization that all those medals and ribbons were earned by doing something, by proving yourself. I used to and still do like getting up early in the morning. Running, push ups, sit-ups, cadence calls, saluting and hearing Retreat at the end of the day when they fire the cannon at Building One and everyone is officially off, though not really. I was at a place called Pinion Canyon on maneuvers when we heard over the radio that there was a bombing in Oklahoma City. For a moment, all I could think was that we were being attacked and that this is what I signed on for...Let's Go! As details emerged about what had actually happened, we calmed a bit though saddened by the loss of life. I tell everyone the truth about my military career. It was not defined by any conflict or call to action. I went in during that sweet spot where people were coming back from Mogadishu and I was getting out just before my unit was deploying to Kosovo. My two years and 17 weeks were defined by hard work, constantly learning, blackout drunk trip to Vegas on my 21st birthday, pressing uniforms, firing cannons, rifles, and pistols (THE ARMY DOES NOT HAVE GUNS!). I still have the two dots on my chest from when I graduated Jump School (they put your wings on your chest without the dammets behind them and punch them into your chest as hard as they can and say, "Welcome aboard, soldier"). I learned a lot about computers and earned enough money for most of my time at Clemson. When people ask me why I went in I tell them that I went in and they should go in for a melange of reasons. It should be for the love of your country. It should be because you respect the institution and see the service that you can provide for it (the only time I feel that paradigm should be so delineated). You should go in to get discipline and learn about yourself. Money and education, yes, those too, but not solely those because that weakens the institution. Do not go in because you have no place else to go or because you cannot get a job at McDonalds. Go in for a mixture of those reasons. The chances are that in the world we live in, some mad man a third of the way around the world is going to do something stupid and you are going to have to suit up. It never happened to while I was in, but I was ready for it every single day that I put on that uniform. When I took it off for the last time, I noted how when it was issued to me, there was so little on it. It was a blank green when it was thrown at me from a bin at Ft. Sill, OK. When I left, I put it in a garment bag and noted how it had gold rank sewn on that said I was a Specialist. It had brass Cross Cannons, that showed that I was in the artillery. It had multi-colored ribbons (my favorite was a solid blue tab that showed that my unit had earned a Presidential Unit Citation). I was expert marksman, I was part of the 4th ID at HHB 3/29 FA.